Maharashtra Forest Surveyor Syllabus 2019: Candidates who are ready to take part in the Forest Surveyor Examination 2019 must focus on this page to get the latest MFD Forest Surveyor Exam Pattern and the MFD Forest Surveyor Selection Process 2019. Furthermore, the Maharashtra Forest Department (MFD) officials decided to conduct the test tentatively in March 2019. So, with the help of these Maharashtra Forest Surveyor Exam Syllabus topics for each subject, you can well prepare for the MFD Examination. The direct link for the mahapariksha.gov.in Forest Surveyor Syllabus PDF Download is made available at the end. The officials of the Maharashtra Forest Department (MFD) decided to conduct only two rounds to hire candidates who have the complete skill set. Candidates can get the direct information of the MFD Forest Surveyor Selection Process 2019 from the current section. Furthermore, with the help of these rounds, all the applied aspirants can easily find the rounds that are to be performed until the recruitment process ends. Candidates can check the latest MFD Forest Surveyor Exam Pattern 2019 to know exam structure and beneficial data about the structure of the question paper. Well, you can even collect information like the names of the concepts, type of questions in the exam, total questions, and marks from mahapariksha.gov.in Forest Surveyor Test Pattern 2019. It also offers you with the duration of the exam and the time duration, the difficulty of the test. Go through the Maharashtra Forest Surveyor Written Test Pattern 2019 to obtain the marking scheme and the subject weightage for all the topics. So, to score more marks in the test, you need to refer to the below table. 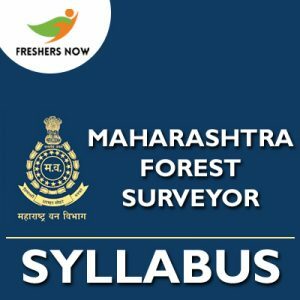 Well, before going to start preparing for the examination, all you need to refer to this section to know the subject wise Maharashtra Forest Surveyor Exam Syllabus 2019 topics. So, do make a note from the below listed topics and then prepare a perfect plan of action to get more marks. Moreover, you can even observe the direct link attached to download the Maharashtra Forest Surveyor Syllabus 2019 in PDF format from the end of this page. Soon after downloading it, concentrate on the heavy weightage topics to cover them before the test. Later on, you can easily cover the remaining topics in the mahapariksha.gov.in Forest Surveyor Syllabus 2019 PDF. It is a must for you to read an practice all the topics. By more preparation, you can easily enhance your skills which leads to the best attempt in the upcoming examination. Also, time management plays a key role in preparation. Candidates can get the entire information of the Maharashtra Forest Surveyor Syllabus 2019 in PDF format from the above link. So, start preparing with the given material for the examination. Furthermore, bookmark us on our Freshers Now portal by Ctrl + D to get all the valid updates.